Court marriage is a very important procedure of legal and valid marriage.In case, when you face any problem between your spouses in future, you can legally take an action against him or her. Marriage Registration is a very simple and fastest procedure in India.This is a best piece of evidence offered by court and approved by Govt. of India.This is a union of two soul or couple performed under law. Marriage Certificate is a document providing social security, self-confidence particularly among married women.It is a document, which provides valuable evidence of marriage. Arya Samaj Marriage Mandal offering Court marriage services in rohini, pitampura, Shalimar Bagh, Paschim Vihar, Netaji Subhash Place/Delhi. 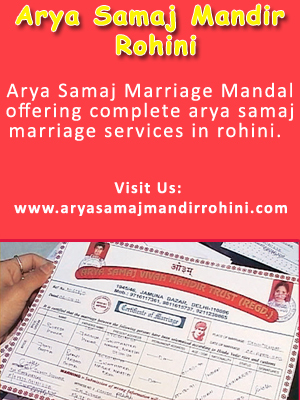 Court Marriage Certificate in Rohini/Delhi. Love Marriage in Rohini/Delhi, Muslim Marriage in Rohini, Arranged Marriage in Rohini, Court Marriage for Same Day and 30 Days. How easy to get married at Arya Samaj Mandir Delhi! The way of solemnizing marriage in court Delhi is very easy and convenient. It hardly take 1 to 2 hours to complete the marriage ceremony. What all Documents required for arya samaj mandir Marriage! You have to simply provide the Age Proof, ID Proof, Address Proof, Passport Size Photos and two witnesses with their one photo and Id Proof. How much time it take for court Marriage in Delhi! In 2 to 2.30 hours your Marriage Ceremony will be completely finished.